A ferry has crashed into two yachts and run aground on the Isle of Wight. The Red Falcon hit the boats while trying to berth at Cowes Harbour, the Maritime and Coastguard Agency said. A member of the public called 999 reporting he had heard cries for help from within the harbour. Heavy fog has hampered the search and a helicopter scouring the area has had to turn back due to low visibility. Lifeboats from Cowes and Calshot are in attendance. 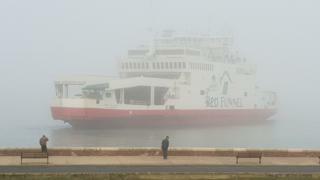 The Red Funnel vehicle ferry is stationary about 50m (165ft) off the esplanade at East Cowes.